There was an an interesting feature about the history of bell bottoms from Amber Butchart. Our highlight garments were Jen's Flares, Jen's Punk outfit and Alexei's Maxi Dress (although he was lucky that the fit was so good without trying it on his "dummy... I mean model, she's alive!" It's getting more emotional saying goodbye to our new friends and this week was especially hard as we really loved Ben's creative flair, which unfortunately may have been his downfall as he always pushed the envelope and never played it safe, which we really admire. 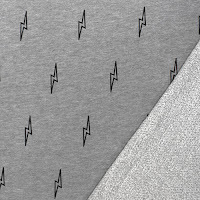 Week 4 is all about technical fabrics so it should be even more challenging than what we have seen so far which has already been very difficult! 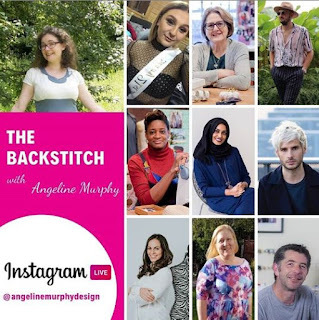 If you are left wanting more after the show has ended, Angeline Murphy, former contestant on Season 4, is hosting 'The Backstitch' on Instagram Live each week straight after each episode. She catches up with other former contestants to get their views on the latest episode. To join in on the Instagram Live series all you need to do is follow Angeline (@angelinemurphydesign) on Instagram and watch the live chat at 10pm. 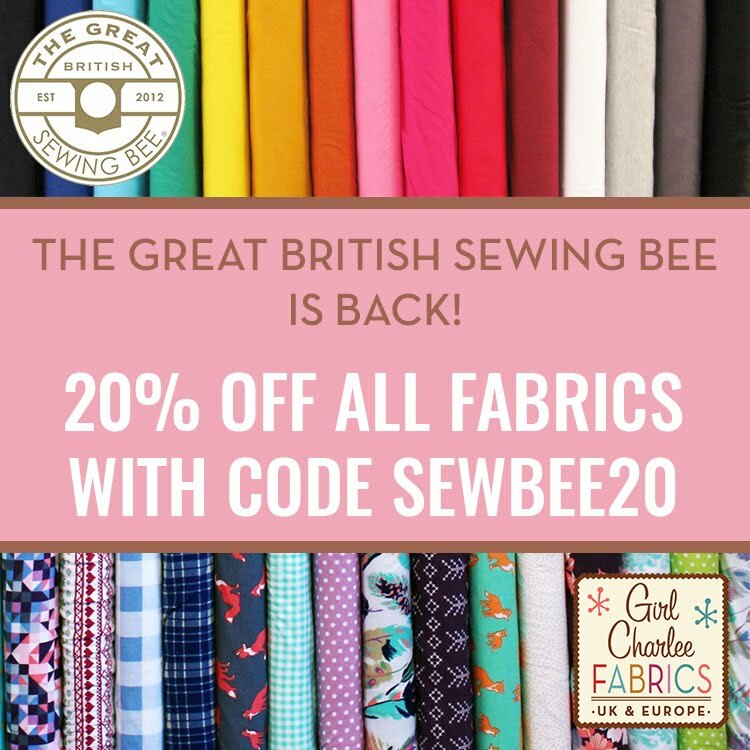 Sign up to our email newsletter to keep up to date with all our new fabrics, competitions/ giveaways and all the Knitty News! The sign up box is HERE or on our website. Happy Sewing! Last night's Sewing Bee was children's week, featuring our favourite fabric - Knits! The challenges were a child's hoodie, monster costume and dance outfit and every single garment was amazing, including Joe's bee costume! As always, the difficulty of sewing with knits was a little over exaggerated, but we understand that they have to have the element of drama and tension (no pun intended) and the challenges are on tight timescales so we'll forgive them. Knits are not difficult to sew! 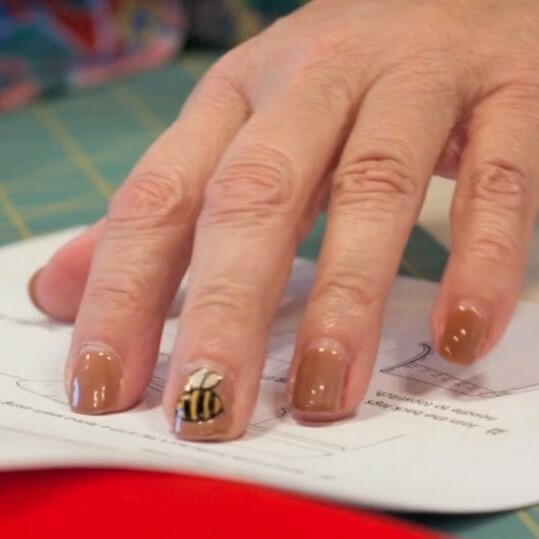 One thing we noticed was how many contestants were using scissors to cut their patterns. We think that a rotary cutter is a better tool especially for knits as it allows the fabric to sit flat as you cut it, ensuring that it doesn't stretch or distort. 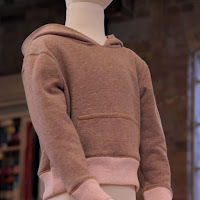 We're not sure what Esme meant when she said Ben's hoodie would "unravel" after washing due to his un-overlocked seams, as knit fabrics famously don't fray, but she has about 50 years more experience than us, so we will bow to her superior knowledge! There was an excellent feature about the history of the sweatshirt from Amber Butchart. Our highlight garments were Juliet & Mercedes' hoodies and Leah's gold caped super cat, (I wonder why?! ), Ben's ant costume and Leah's black swan costume. It's always sad to see a contestant leave and Sheila was amazing (her Rhianna inspired top last week was one of our favourites). "It's OK to iron children, right?" "Let's make that hoodie a goodie!" "You've got 21 seconds to sew!" "What do you think of my new catchphrase?... That's good sewing." "Excessively boning... is that a good idea at this stage of the competition?" "Go and have a nice relaxing night, or a hot steamy one if you like, we won't judge you." It has to be Patrick flossing! The picture doesn't do it justice, watch the show (37m25s) to see it's full glory! Week 3 is all about the 70s! As a collector of antique sewing machines I can't wait to see how they cope with the old machines! 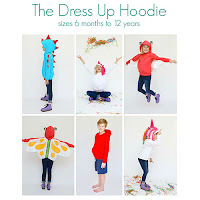 Liesl + Co are also hosting a fantastic sewalong for the Neighborhood Hoodie this week. 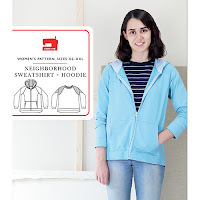 They want to make sure you sew the best sweatshirt or hoodie you’ve ever worn, so the sewalong is set at a nice leisurely pace, with lots of helpful hints and tips. 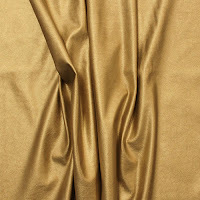 We're offering 15% off our fabrics with code LIESL15 until the end of the sewalong (28th Feb). Last night's first episode was a roller coaster ride, no gentle lead in for the contestants! 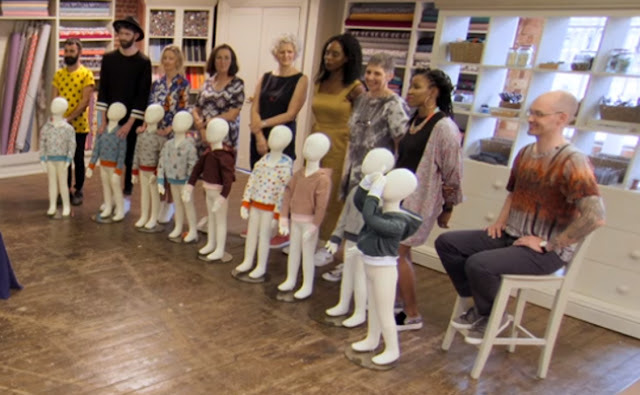 We laughed (at Joe and Patrick's brilliant quips, see below), we cried (with Juliet's tears of joy at winning garment of the week), we gasped (at the difficulty of the challenges!). 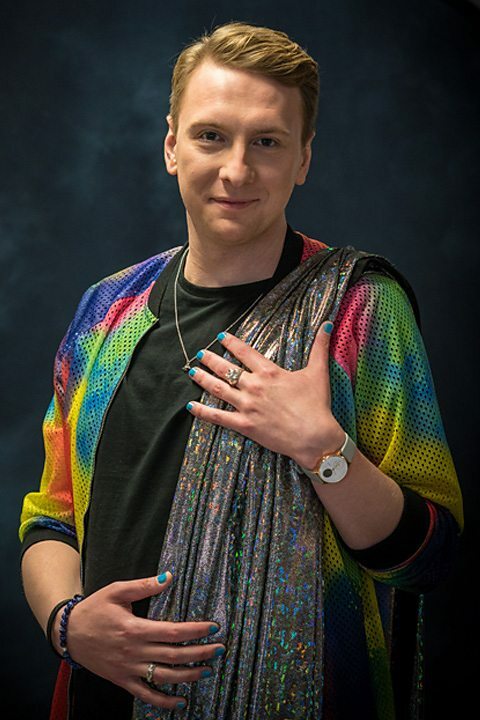 The new host, Joe Lycett, is a perfect (dare we say better?) replacement for Claudia... funny, energetic, helpful and genuine. 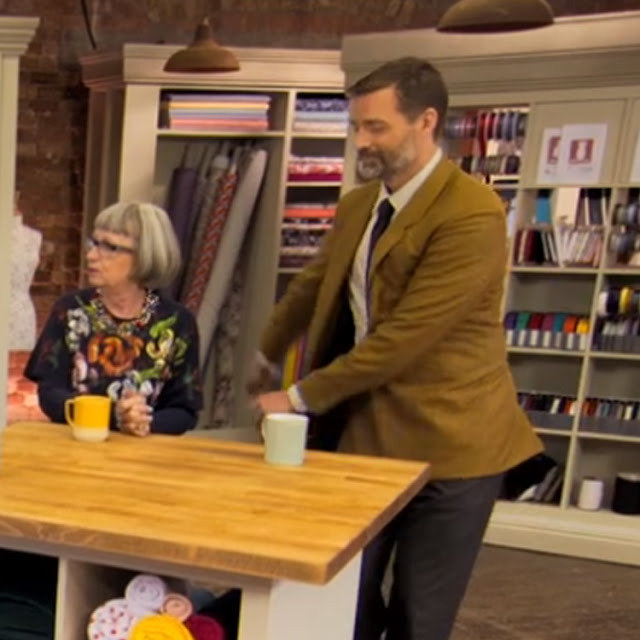 His sewing knowledge may be lacking (as was Claudia's) but his passion, sense of humour and incredible fashion sense (we love that jacket!) more than make up for it. 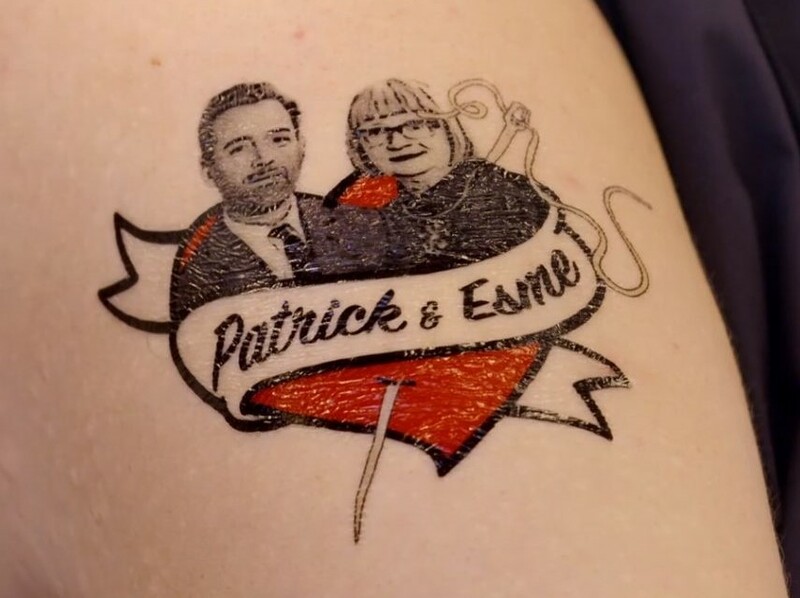 We love his tattoo too! Patrick and Esme were also on fine form, although we felt they were less critical than we've seen previously. I'm sure they will get tougher as the season progresses! 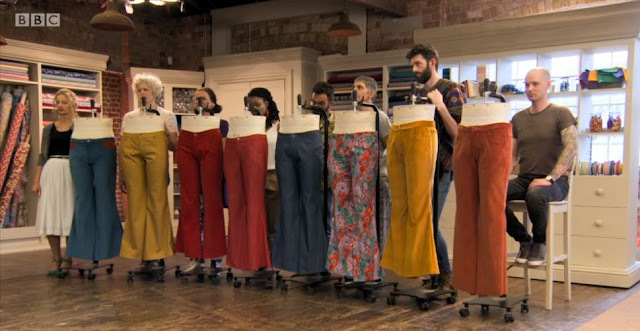 The first episode saw 3 quite hard challenges in comparison to previous years (a wiggle dress with a multitude of darts, a denim refashion challenge and a jumpsuit), so who knows what they will be sewing in the latter weeks! Our highlights were Ben's beautiful red wiggle dress, Sheila's Rhianna inspired puffy sleeved denim top, and Juliet's stunning contrast jumpsuit. It has to be said that even with the difficulty of the challenges there were no horror makes (except maybe a misplaced "crotch pocket"!) so well done to everyone! We already feel like all the contestants are old friends and it was sad to see Tom go as he is clearly a very talented sewer. It's so hard to pick a winner from the 10 (now 9) as they are all very good technical sewers and they all have incredible creative design talents. Ben and Jen from Girl Charlee have their obvious namesake favourites, I am gutted there is no contestant called Mark for me to root for so I will just have to change my name to Alexei or Riccardo for a few weeks! "A little hungry in the bum, that's the technical term." "It's more of a bubble than a wiggle." "Is it deliberate that the cars are upside down?" "I would take a pair of shorts and transform them into a pair of shorts." Esme "We have an invisible zip" ... Joe "I can see it, why are you lying to me?" It has to be this stunning photo of Esme! 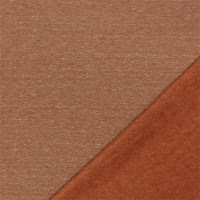 Week 2 sees children's clothing and of course our personal favourite... Jersey! We can't wait! If you are left wanting more after the show has ended, Angeline Murphy, former contestant on Season 4, will also be hosting 'The Backstitch' on Instagram Live each week straight after each episode. She catches up with other former contestants from the show to get their views on the latest episode. To celebrate the Bee's return we have a 20% discount code running all this week. Until then, here are all the contestants' profiles so you can get to know them all better. Although born in Plymouth, Ben has spent the majority of his life north of the border, and currently lives in Edinburgh with his two dogs. Ben trained as a veterinary surgeon and has spent the past five years pursuing a career in science. Despite his academic background, Ben has always loved fashion and design. Ben credits his sewing skills to the many fancy dress costumes he needed to create during his time at the University of Glasgow Veterinary School. 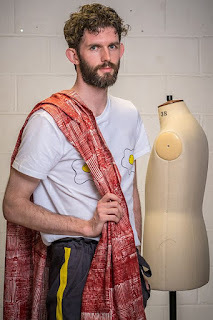 Ben sees sewing as his creative outlet and enjoys experimenting with pattern drafting and bold textiles, and he even screen prints his own designs onto fabric. Aside from sewing and science, Ben harbours dreams of running away to join the circus as a static trapeze artist. Janet lives in North Yorkshire with her husband of 48 years, David, and their dog. As a little girl, Janet was taught to sew by her Italian mother, and at 16, was making her own clothes and soft furnishings. 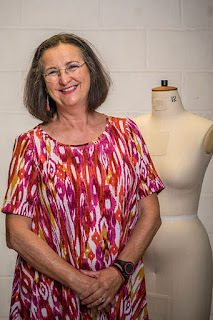 However, after having her three children, Janet had a 20-year hiatus before taking up sewing again in 2015 when she was inspired to sew for her grandchildren. 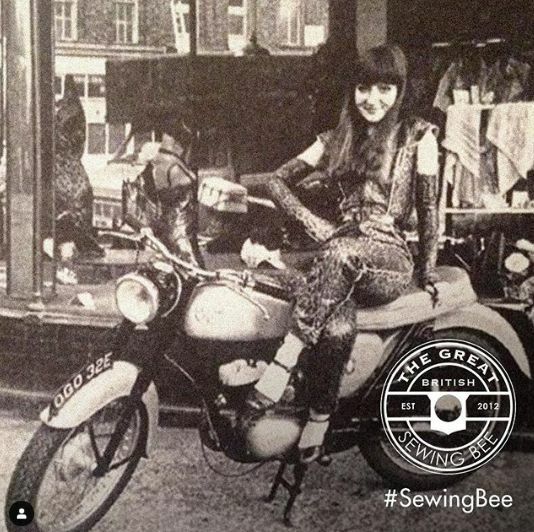 Janet enjoys upcycling her outfits, as well as giving her garments an artistic flare by personalising them with quilting and embroidery details. Fashion has always been an important part of Janet’s life, as she owned a wool and knitting supply shop before working as a magistrate for 20 years. Now retired, Janet spends the majority of her time as a ‘fair weather’ landscape painter and has had her work featured in exhibitions around the country. She also enjoys making beaded jewellery and playing golf. Jen lives in Glasgow with her husband Neil, children Cameron and Kirsty, and the family dog Archie. A former litigation solicitor and then small business owner, Jen put work on hold in 2016 to spend more time with her family. With an empty nest looming, she has recently agreed to lead a local knitting class while considering options for her third career. 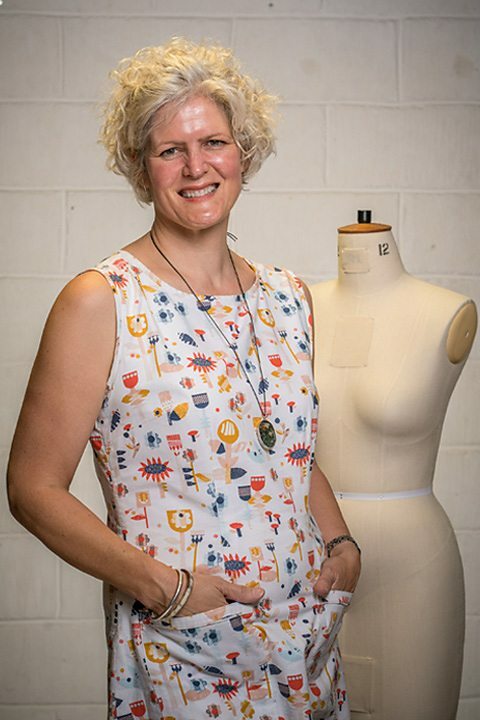 After receiving her first sewing machine at 14, Jen made a lot of her own clothes in her teenage years, including upcycled charity shop finds and some outlandish outfits, but struggled to find time for sewing after starting her career. It has only been in the last couple of years that she has returned to it on a regular basis. Jen appreciates clothes with clean lines and a strong sense of structure, often with a Japanese influence. Generally addicted to designing and making things, her home is full of her work from a wide range of skills and crafts including knitting, pottery, silversmithing, photography, even a bit of carpentry - and of course sewing. Originally from Nigeria, Juliet moved to London in 2006 where she now lives with her husband, Ken, and their 5 year old daughter. As well as being a primary school teacher, Juliet has a degree in human nutrition and works as a weight loss consultant. Juliet has been sewing for five years, but was initially intrigued when a dressmaker in Nigeria took her measurements over the phone and created her a bespoke dress. 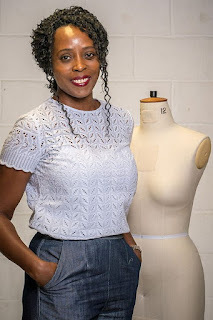 Years after moving to the UK, Juliet taught herself to sew using YouTube videos and sewing DVDs. She enjoys crafting creations out of bright, bold fabrics and African wax prints. Juliet shows off her latest fashion creations on her blog where she sometimes documents her weight loss and fitness journey. Mercedes was born in Hammersmith, London but moved to East Sussex when she was 17. Her Italian grandmother taught her to sew at a very young age, and by 13 she realised that if she wanted to wear the style of clothes she wanted to wear, she would have to make them herself. Mercedes served in the Territorial Army for 13 years, but left to start a family with her husband, Graham. Their son Jack, works and lives in London while their daughter Eve and the two cats, Maggie and Erica, live at home. Mercedes now describes her sewing style as comfortable, definitely not on trend but hopefully with a touch of Brighton “chic”. When she’s not sewing or pottering in the school garden, where she works as a reprographics technician, Mercedes and her husband like to escape in their camper. Riccardo grew up in Puglia, south of Italy, in a small town near Lecce. Together with his three sisters, he spent his childhood between the blue sea of Salento and the deep green of its olive trees. His mum had a passion for sewing, and for Riccardo, the sewing machine has always been part of his family environment. However, he only started to learn after moving to London. 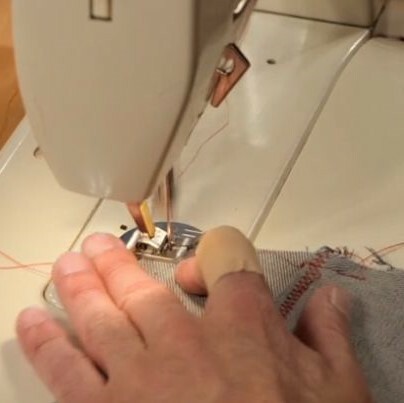 He started taking sewing classes seven years ago and hasn’t stopped since. 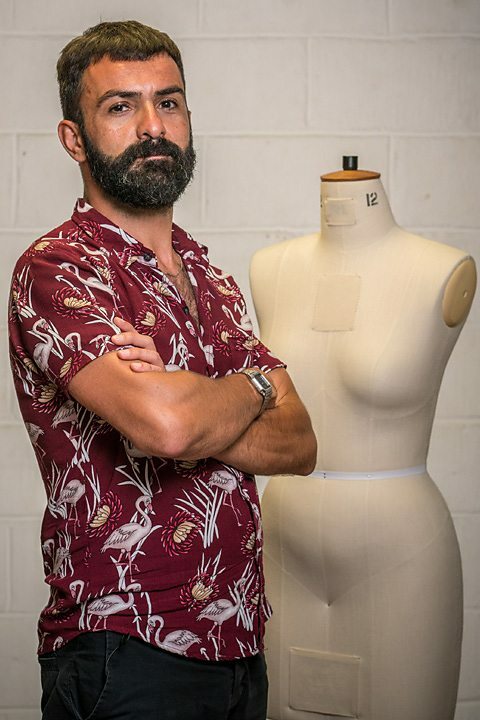 Riccardo is an advocate of Reuse, Reduce, Recycle, he loves up-cycling and charity shops. He is most proud of a bomber jacket he made using the leather from a sofa he found in the street. Riccardo also likes to keep fit and enjoys cycling, running and playing volleyball in a local East London team. Currently he works as a multimedia producer for an organisation creating educational resources to engage primary and secondary school students with humanitarian and environmental issues. Tom started playing with a sewing machine around eight years ago, but didn’t start making clothes until three years ago, when he began to create dresses for his mum. 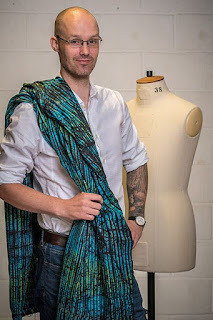 He primarily taught himself using YouTube tutorials and sewing blogs, and in the last year has also begun to make menswear. 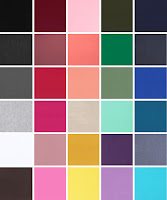 Tom is particularly attracted to bright, flamboyant and garish colours and fabrics. Tom is a motion graphics designer, and whether it’s in his animation work or sewing projects, he loves experimenting with different colours, shapes and textures to try create something unique. Sheila is the youngest of nine children born to Jamaican parents who arrived in England as part of the Windrush generation, and settled in Stoke-on-Trent. Sheila now lives in Ilford, Essex with her daughter Rihanna, 24. Sheila developed a love of fashion from an early age and has been sewing for 40 years. She describes fashion and making clothes as being in her blood. One of her earliest memories was the constant whirring of her mum’s sewing machine - it was in part the soundtrack of her early life. As a child, Sheila was inspired to make clothes for herself, something which has carried her through into adult life. Her personal style is smart and elegant and she takes inspiration from Meghan Markle, Victoria Beckham and Stella McCartney. 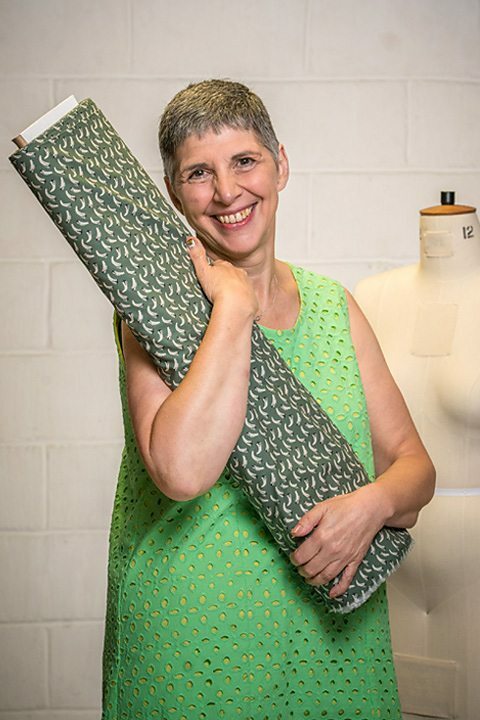 Sheila works with a wide range of fabrics and styles and has a passion for vibrant, colourful prints. Sheila enjoys making occasion wear for events such as Ascot and weddings. Outside of fashion, fitness is a big part of Sheila’s life. 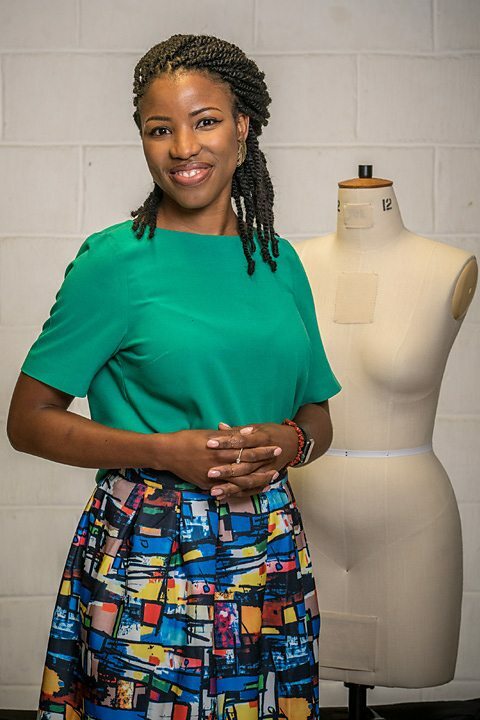 Her aspiration is to specialise and create bespoke high end clothing for all women. Having started her career working for some of London’s most recognised cultural institutions, including the Southbank Centre and the V&A, Leah moved from her role as an Executive Assistant at the Barbican Centre to her current position as Practice Director for an award-winning firm of Architects. Leah loves London’s cultural scene and regularly enjoys the theatre, gigs, dining out and a cheeky martini with friends. She has practiced yoga for over 20 years and restarted ballet as an adult having given it up as a child. Leah is a self-confessed "selfish sewer" who began her passion five years ago, inspired by high end ready-to-wear collections and couture classics, always with the ambition to recreate beautiful garments that are way beyond her budget. Leah also loves reading fashion magazines and dreaming up designs to put in her scrap book to inspire future sewing projects. At 5’2’’, she struggles with the fit of standard high street clothing, but benefits from being able to use luxury fabrics (often end of roll pieces) in small amounts for a fraction of the cost. Alexei is a manufacturing engineer, working with CAD-CAM systems and helping to develop better manufacturing processes for structural components. After finishing his degree in aerospace engineering, Alexei decided to pursue an unexplored passion for singing, training at the Royal Welsh College of Music and Drama. Alexei and his wife Beth met while both performing in Bach's St John Passion and have been married for three years. They live in Leeds with their cat, Moth. 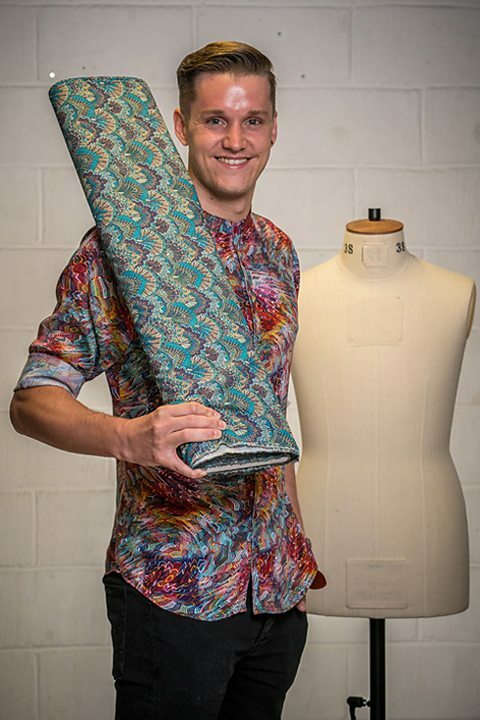 Alexei started sewing just over two years ago and enjoys using his engineering skills to make precise garments, paying close attention to the smallest detail. 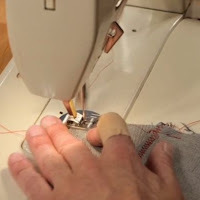 Having had MS for more than 10 years, which affects the right side of his body, he has had to learn to compensate with his left hand while sewing. He also enjoys reading, writing and still sings occassionally. Multi award winning comedian Joe is one of the country’s best-loved stand-ups, enjoying three sell out UK and Ireland tours, scooping two Chortle Awards and an Edinburgh Comedy Award nomination for his warm, sardonic brand of comedy. He has hosted Live at the Apollo, The One Show and Sunday Brunch, and appeared on a range of shows including 8 Out of 10 Cats Does Countdown, Would I Lie To You?, Taskmaster and Roast Battle. He hosts BBC Radio 4’s It’s Not What You Know and created Joe Lycett’s Obsessions for the same station, and in 2016 released his debut book, Parsnips, Buttered (Hodder & Staughton). In the summer of 2018, a piece of his artwork was accepted into the Royal Academy’s Summer Exhibition - a clay and acrylic head he named Chris, priced at £12.5 million (proof of funds required before purchase). 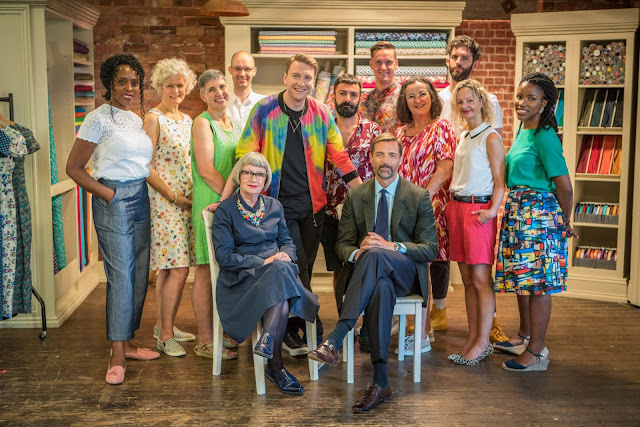 As well as taking up hosting duties of The Great British Sewing Bee, Joe fronts new BBC One Saturday night show The Time It Takes, and will deliver consumer justice in new Channel 4 series Joe Lycett’s Got Your Back. Patrick is a regular on television and radio as a commentator on the British fashion, clothing and textile industries. He has been a contributor to several major television documentaries including Savile Row, Harris Tweed, and The Perfect Suit, but is best known for his role in the The Great British Sewing Bee, for which he earned a 2017 National Television Awards nomination. Patrick’s career in fashion has spanned over a decade. In 2005, after leaving a career in engineering, he took over as Director at Savile Row tailor Norton & Sons. He won much praise for his work there including being named Retailer of the Year at the 2008 Scottish Fashion Awards. In December 2010 he won the Menswear Designer of the Year award at the British Fashion Awards, and in May 2015 he was awarded the BFC/ GQ Designer Menswear Fund - both for his work on menswear brand E. Tautz, which he re-launched in 2009. 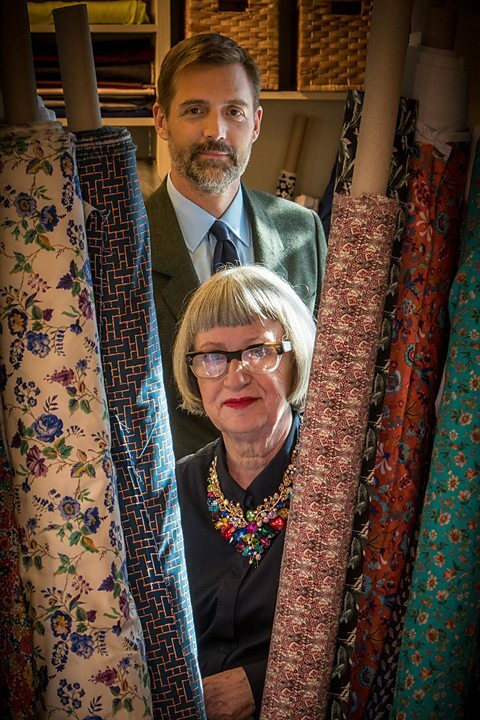 Esme, along with four women passionate about fashion, opened a London based shop called ‘Swanky Modes’ in the 70s. Their clothes appeared in magazines and newspapers including Vogue, Nova, Honey, 19, ID, The Face, Boulevard, Interview, The Sunday Times, Express, Mail, and the V&A Little Black Dress Book. Swanky Modes’ clothing was photographed by renowned photographers such as Helmut Newton, David Bailey, Nick Knight, John Swannell, Neil Kirk. The iconic shop attracts a diverse clientele and has been visited by Julie Christie, Toyah Wilcox, Princess Julia, Midge Ure, Bette Bright, Viv Albertine, and Grace Jones.